The iceberg theory, which Ernest Hemingway uses, means that the good writer doesn't need to explain the plot of the story for public, it is enough to give to the reader a right picture, to draw it precisely. The imagination of the person will make the job of depicting the story better than it would be done by the writer. The short story "Homage to Switzerland" demonstrates this writing style very well. It includes the three stories, all taking place on train stations in Switzerland. The first one is about American who tried to flirt or maybe humiliate the waitress being aware that he couldn't do it. The second story is about a successful writer who pretends being careless about his divorce. The last story is about a man who wants to show his well being as he is proud of his father who committed a suicide and it doesn’t look sincere. Considering some facts, it is likely autobiographic work. Hemingway was known to have been most distraught following his divorce from his first wife, Hadley, but he was divorced three times in his life. Hemingway's father committed suicide in 1928. - the rhythm of life described by the author is calm as it occurs in Switzerland. There is an opinion that "Homage to Switzerland" isn't an homage to this country, but Hemingway's attempt of freeing himself from his life's struggles. 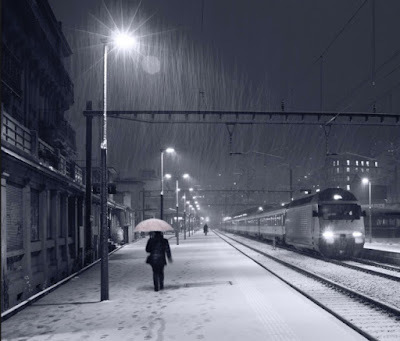 Train stations are temporary places where a person could do it. Mr. Wheeler flirted with the waitress. But he knew that he couldn't have relationships with her. Mr. Johnson tried to forget about his divorce, he wanted to persuade himself and others that it is not a big deal, but he wasn't able to forget. The Son of a Fellow Member pretends he has an interest in the National Geographic Society, he demonstrated an interest in this like his father. But the fact that his father committed a suicide, feeling sorry for this fact, put protagonist outside of the world Geography. The common is they are all trying to escape reality. Switzerland is the calm and happy country where it seems people could forget about their problems, but is it real? Ernest Hemingway suggested to readers to think about it.